After what felt like the longest winter we have ever had, warm weather and sunshine are finally here! We made it through, and now it is time to enjoy summer with her warmth, beauty, and long days. Treating the outside of your home as an extension of your indoor living space is one of the best ways to enjoy your home along with the long days and warm nights of summer. 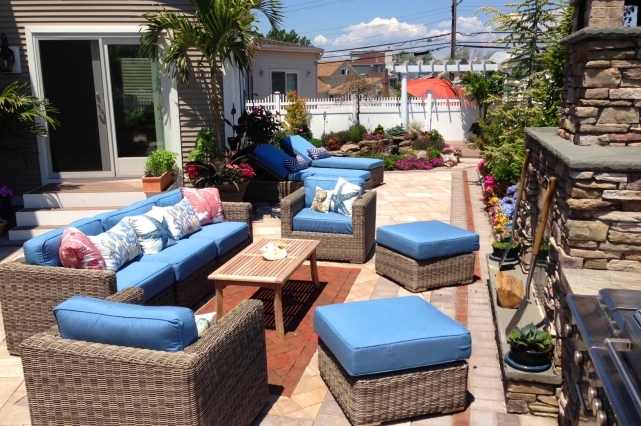 Creating outdoor living spaces for living, cooking, and entertaining has become a mainstay of Long Island living. Clients are looking for ways to maximize their outdoor space to harmonize function and beauty into a space where they can dine, entertain, live, and retreat to. Some of the more popular features people are requesting are outdoor living rooms, dining areas, spas, outdoor kitchens, outdoor fire features, and water features. Defining these areas with additional features is really where design is so important. There are many different ways to define an area such as a pergola or pavilion, as well as a more subtle feature like an ‘area rug’ made out of paving stone or natural stone. Regardless of budget, hire a landscape professional to help you design your outdoor oasis. This way, you are dealing with one person who can coordinate everything for you and make sure it all comes together seamlessly, and who also has the best people to build it. Managing your own project by hiring multiple companies often end up compromising time and a well-integrated design as well as costing more money. The core, or foundation, for creating your outdoor living space is often a deck or patio. More often times, it is a patio because it is more versatile and has features such as outdoor kitchens, bars, and fire features which can be added on at a later time. Patio pavers come in a wide variety of colors, textures, sizes, and patterns; which makes them the ideal choice when designing an outdoor space that is complimentary to the home as well as having the ability to make unique enhancements. No matter what style home you have, whether it’s traditional, contemporary, beachy, casual, or formal; there are a variety of pavers that will coincide with the character of the home. Working with pavers or natural stone also allows countless options of embellishments such as mixing materials for added texture and color; adding on features such as outdoor fire features & kitchens; adding sitting walls and light piers; just to name a few. One of our favorite ways of working with natural stone and pavers is to add multiple borders to a patio or create an ‘area rug’ by creating an inlay by mixing materials, patterns, and/or colors. Of course, decking materials have come a long way and the new composite decking materials withstand the elements and provide their own beauty and style. It is just a matter of personal preference whether to go with a deck or a patio – they both provide years of enjoyment and are the foundation of a well designed outdoor living space. Outdoor cooking and dining has become just as functional and full of features as indoor cooking and dining! Outdoor kitchens have endless design capabilities with today’s outdoor cooking components such as pizza ovens, griddles, rotisserie systems, and side burners. Other features include refrigerators, sinks, and ice-makers. Many high-end appliance makers have jumped on this outdoor cooking trend and now make high-end cooking appliances for outdoors. The beauty of all this is that every homeowner can have their own custom outdoor kitchen based on their budget and the features they want. Just like indoors, people tend to ‘hang out’ where the food and drinks are. With this in mind, many outdoor kitchens will incorporate a bar or counter top for people to sit at, or a place where they can ‘stop by’ and chat awhile. These areas can serve as a full service bar or as a buffet area to serve all that delicious food hot off the grill. The most popular material for the counter-tops is Granite and for good reason; it is extremely durable and resists stains better than most other materials such as bluestone or concrete. Creating an outdoor dining area is also top on the list for outdoor living spaces. Sometimes these areas are defined by added on elements such as a pergola or pavilion. 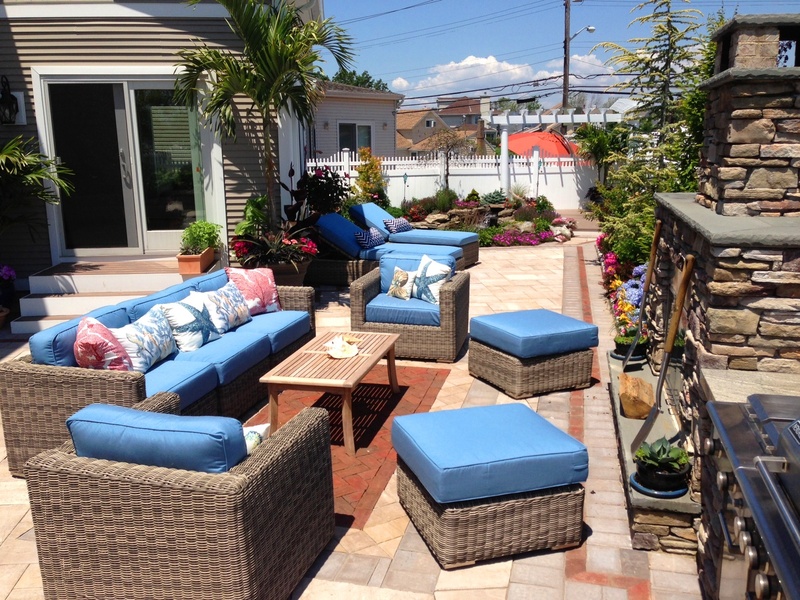 This space can also be defined by using pavers or natural stone as a creative embellishment. Whether the space is defined or not, outdoor dining furniture will certainly welcome everyone to the table. There’s a wide variety of weatherproof dining furniture available at all price points making outdoor dining more comfortable and enjoyable than ever. We have all heard this term used and the outdoor dining area is a part of it. Going beyond the dining area is what we will cover in this section. We think of the outdoor living room as a space or area to sit down and enjoy being outside. 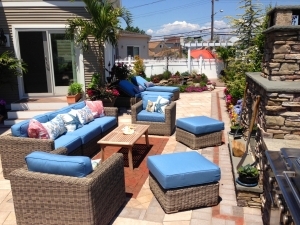 Whether to relax or read, lay out in the sun, or a space to sit with friends to talk and share refreshments – there are endless options to create these areas as well. Outdoor seating typically characterizes this area. Most people furnish the area with comfortable outdoor couches and chairs and with today’s furniture, they not only look great but they are weather resistant as well. The fabrics used on these pieces are typically made from Sunbrella-like fabrics and are fade and mold resistant. Sitting walls are another option to add additional seating, help define an area, or to eliminate seating furniture all together. Sitting walls can be embellished with outdoor pillows and cushions for comfort and style. There are other features that help define this area such as outdoor area rugs that are made from synthetic materials made to withstand the elements. Creating outdoor area rugs with natural stone or pavers is another way, as well as using these materials to create borders. Pergolas and pavilions are another option. Outdoor televisions and sound systems are both more opulent accessories to add to your outdoor living room to truly make it your new favorite room. Integrating elements of water and/or fire adds both beauty and drama to an outdoor space. One of the biggest requests we get is for either a fire pit or an outdoor fireplace. Either one will add beauty and drama to your outdoor space. They also serve as an anchor or focal point to the overall design. People are naturally drawn to the ambient lighting fire features provide as well as the warmth once evening sets in. Water features also add their own special touch to outdoor living spaces. They provide soothing sounds and an inviting solace. Water features provide a great alternative to people who do not have the room for a pool as well as those looking to add a special element to their outdoor space. We see many people opting towards pondless waterfalls and sheer descent waterfalls now because they can still enjoy the beauty and soothing sounds of water without the maintenance of a pond. Another feature gaining traction are rain walls which are basically curtains of water running straight down a wall into a bed of river stones or glass beads. The walls can be made from various materials so designs and styles are limitless! Because there are so many options, working with a knowledgeable professional can help you design and incorporate the features you want in the best way to accommodate your budget and home. This is unique for every home and designed for the best use of your space. A professional will also provide the necessary skilled crews to turn that design into a gorgeous and functional reality! Beautiful plantings are also included for many different reasons like providing privacy, color, softness, visual beauty, and lush escapes. Extraordinary design and build by a professional can completely transform your yard into your own personal entertaining space and retreat! Topaz Design Group wins Houzz Award 2018! Topaz Design Group Awarded Best Of Houzz 2017!